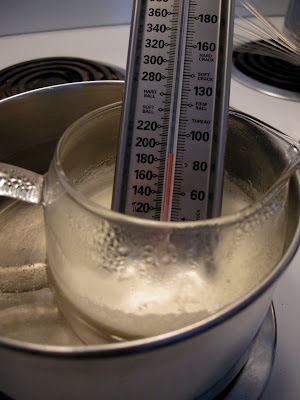 Mary Mary Culinary: Daring Bakers' February Challenge: Tiramisu! 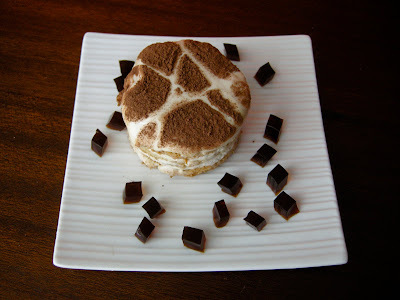 Daring Bakers' February Challenge: Tiramisu! This challenge was exactly what I was expecting from the Daring Bakers! A tiramisu with many homemade components: mascarpone, savoiardi biscuits, zabaglione, pastry cream and of course whipped cream. Finding your own cow to milk to ensure non-UHT pasteurized dairy products was optional. Maybe next time, because I think I could manage that. Seriously. Thanks Aparna and Deeba for an amazing challenge! I only had 4 days to complete this challenge, as I was leaving town for a month, so I couldn't do my usual procrastinating. I was a bit worried when it was recommended that we devote a couple of days to the components. In the end, it turned out that all the individual recipes were quite quick and easy. Really. According to some of my friends, I have a skewed notion of quick and easy, but I find time spent in the kitchen enjoyable and don't want to take shortcuts. This is the raspberry Amaretto variation. It was my favourite, and the only one I actually ate. I found the tart-sweet raspberries helped cut the rich creaminess. 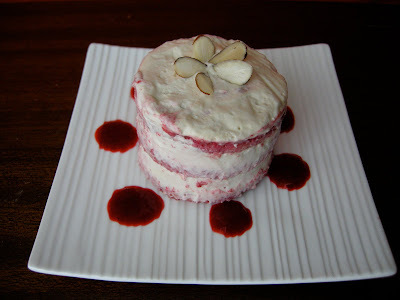 It was also really simple: I put a bag of frozen raspberries through the food mill and added sugar and Amaretto. I used some as a sauce and the rest for dipping the Savoiardi biscuits. 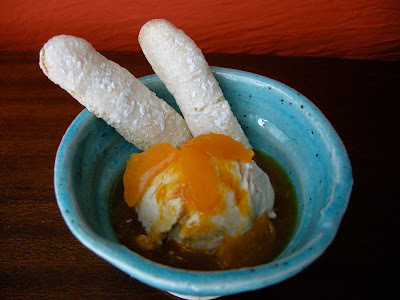 This one is mandarin Amaretto. I had a big basket of mandarins in the fridge to get through, so I juiced them, reduced the juice with sugar and added a generous splash of Amaretto. 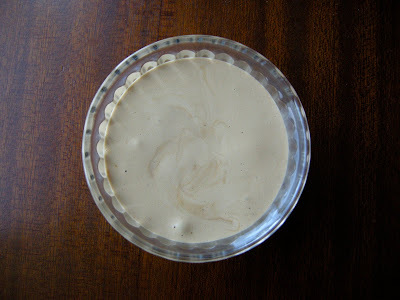 The original coffee version, with some coffee-rum jelly. All the components on the plate reminded of the coffee jelly parfaits I used to eat in Japan. Because I had so much time, I froze some of the filling to make ice cream for some tiramisu parfaits: raspberry. I also made a coffee one, but I wasn't quick enough to get a picture and it was a soupy mess. A tasty soupy mess. 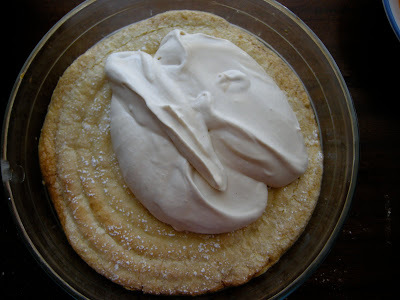 Continue reading after the jump for photos of the ladyfingers, mascarpone, and zabaglione. Here's the link to the full PDF of the recipe. 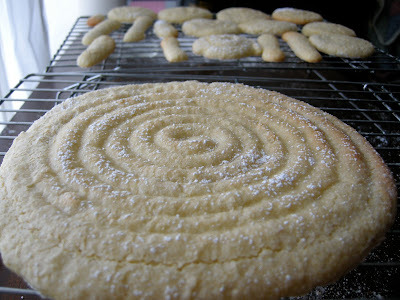 Savoiardi, piped and ready to go into the oven. These were amazing! 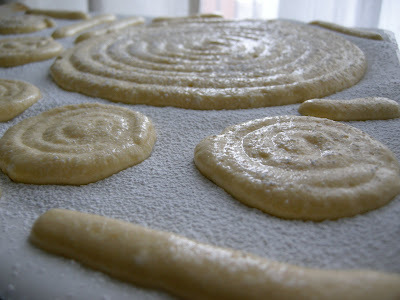 I promptly ate half the batch and had to make more the next morning. Many were very concerned about the eggy flavour, but I thought they were great. They tasted just like store-bought. Better, actually. After last month's challenge I swore off buying graham crackers and I won't be buying ladyfingers any more, either. It's not like I ever bought either of those things anyway, but still, you've got to take a stand sometimes. Cooling off. This must have been the first batch, because there are definitely not enough here. There were so many questions and concerns about the mascarpone. Some bakers couldn't find non-UHT cream, others couldn't get the cream up to 190℉, still more couldn't get it to curdle when the lemon juice was added. Some had results that were too thick, some were too thin. I could go on and on and on. Anyway, there was a great discussion in the forums about it all. Should the bowl be suspended above the water, or placed directly in the water? Many speculated that only metal bowls should be used, as glass wouldn't allow the temperature to get as high as necessary. As usual, I ignored most of the advice, and made mine in a glass teapot. As you can see above, it got to the right temperature, and turned out fine in the end. 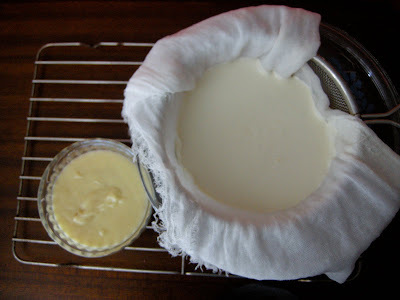 Draining mascarpone, meet cooling pastry cream. And after. I whipped mine while it was cooking, so it was very fluffy instead of custardy. This is the large, coffee tiramisu that I hope is still in my freezer when I get home. If not, no worries M--I know that watering plants is hard work! I just might make another one for Easter. If you're still reading, thanks! Tune in in a day or so to see what I made with some of the leftover challenge ingredients. 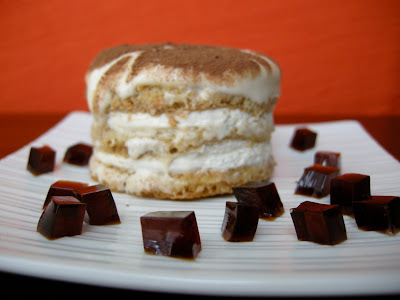 Oh, and go here to see what kinds of tiramisu the fantastically creative Daring Bakers have come up with. oh Mary, that looks super delicious and very pretty! A gold medal for sure!! Wow they are all very pretty. But the raspberry amaretto looks so heavenly! Thanx for stopping by mine, and I adore yours. The jellies are such a great idea and I'm partial to the mandarin idea, too. Fabulous job. Wow, you really went to town with this! :-) They all look amazing, and I love the flavours (especially the raspberry and Amaretto), how delicious! Where did you live in Japan? I've been admiring your tiramisu creations for a while now - each time I have a peek on the forum thread. All of them sound and look gorgeous, but I think - like you - the raspberry one would be my favourite. I think I might just put up soggy sponge for that! Ho Ho! SO many versions! This is just fantastic. Arent you the industrious one! Splendid! Just Splendid! Wowo so many flavours and each eaqully good. Would be difficult to make a choice! I love all the different combinations you did. I'm always a traditional kind of girl, but I wouldn't mind trying one (or all) of those! All these different versions - YUM! Your Tiramisu's are all so beautiful! I also did the Raspberry version! The Amaretto in the zabaglione was magnificent. I froze the Tiramisu that I made in the Trifle dish and cannot wait to have company to serve it to! Wow. So many flavours, so little time. I think I would try the raspberry one first. Or maybe a parfait. Or maybe the mandarin one. Gorgeous job on this challenge! Good luck finding a cow to milk for next time ;D.
I love the one with Madarin ! 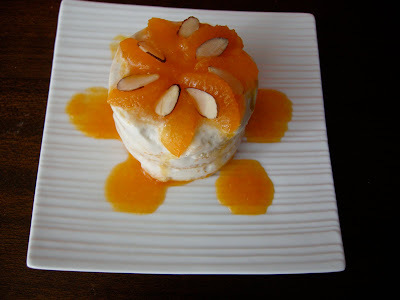 The Orange is abolutely beautiful and the presentation too ! Wow! Great job. All of your versions look awesome, especially the raspberry one. Wow, you made so many delicious variaties! Love the coffee rum jellies, wonderful idea! Love your cocoa pattern a lot too! Wow, very creative, well done! WOW ..all yours are very good! I would do a raspberry ! Looks yummy, and i like your giraffe pattern. Those look SO good, and I am sure they were delicious! The mandarin one looks gorgeous, though I think I would have a very hard time choosing between them! Great job on the challenge. Wow great advice always go by what you think I had no problems with the cheese and your final versions look wondrous. Well done great job on this challenge. Cheers from Audax in Sydney Australia. What a beautiful job, I'm looking forward to making the cheese again.. I already used mine all up! Wow, I love all the different versions! I definitely will try a raspberry version in the future. Can't wait for March! These look fabulous! I agree with the fruit cutting through the creamy richness. Nice work! I love the different combinations of fruit, especially the mandarin and amaretto, not to mention the individual servings! Raspberry amaretto sounds so good! 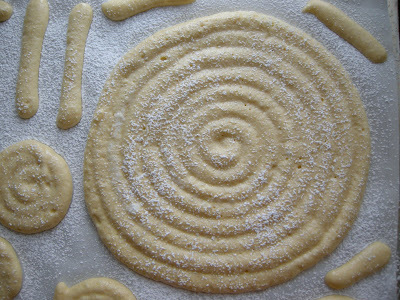 I love your swirled savoiardi, and all of your pictures look amazing. The part about the cow makes me laugh. Sign me up for the extreme DBs! All your components look perfect. My mascarpone never got there and I think I overcooked by zabaglione. That raspberry one looks amazing. Wow so much variety! Well done on the unique flavors! Such creative thinking with your flavours - they all look just beautiful. what amazing things you did with this months challenge. stunning and delicious. ooh wow all of your tiramisus look delicious. I love the look of the raspberry one, so yummy! Ohhh, all the flavours sound gorgeous! Yes, I agree the raspberry would be lovely. My friends also think I have a skewed idea of what is quick and easy in the kitchen. But isn't it fun! Yummy Amaretto! I wish I would have thought to use that. One of my all time favorites. Great job! Love all of your different variations on Tiramisu! Beautiful!! Oh! My... what a fantastic array of deliciousness! I wouldn't know which one to choose, really! They're all so gorgeous looking! You have great talent Mary! Bravo! hard to believe you've done it all in only 4 days.. well done! Hi Mary, well you made the perfect Tiramisu's (or is it Tiramisi ;-) ), they all just look gorguous and the combination of flavours so well chosen!! Me quito el sombrero (I make a deep bow :-) ). Your flavor combinations sounds so so good! I love amaretto too, but I've never thought of combining it with raspberries (which I also love). Wonderful job! Wow, great job on all the variations! I would never had known you made all these in just a few days. I have to say the madarin tiramisu intrigued me the most. Especially with the juice on the side, i neeeed to scrape some off and eat some! Everytime I happened upon your tiramisu pics in the forum over the past few days I've paused to take a second look. I really love the decorated top on your original one. 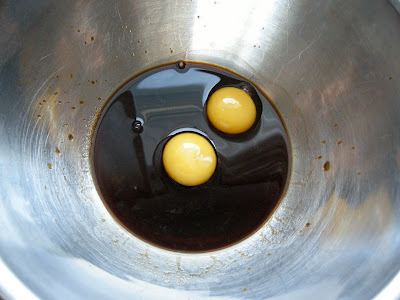 Maybe I'm just missing it, but do you have a recipe for the coffee-rum jelly - that sounds way too yummy! Thanks for stopping by, and for the well wishes. I love all your versions of terimisu and think that I will have to try the raspberry one - YUM. Wonderful photos - beautifully done! Beautiful presentation! I love your raspberries version. I've to try it once raspberries are in season. 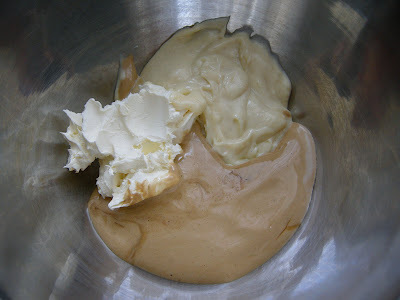 Btw: you can make mascarpone with UHT cream with 30% fat - I did my mascarpone successfully with it. Such neat variations. i bet the raspberry was great. I hope you have some left, too! Incredible flavour variations! And your presentation is fantastic! I'm so impressed! I love all your various flavor variations! Very very nice!! Just saw your recipe of the apple turnovers. I have to try them soon, they look so delicious and I love apple turnovers! wow, so many variations, so impressive... wish i could taste them! It took a mere 4 days to make all of the goodness posted? I am so impressed with your creativity, results and beautiful photography. 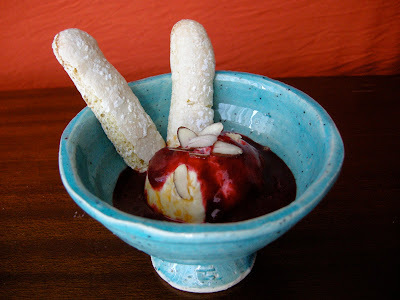 Your tiramisus are amazing. Thank you for the comment. Thank you all SO much! I really, really enjoyed this challenge and can't wait for the next one. I like the idea of making parfait with the spare filling - I froze my classic one to cut slices etc and I think I like it more when it's frozen than defrosted! You did a great job! Each of them looks fantastic! Beautiful tiramisus, love the combinations of flavours! So many beautiful versions of tiramisu and I especially love the mosaic topping of cocoa in the first one. Amazing job!! OH WOW!! Those are fantastic. So creative. Lovely, just lovely. I love all the variations. I can't believe you did all that in 4 days. Amazing! wow such amazing flavours and beautiful photos. Beautiful! I am amazed by how many versions you did. They all look perfect! Wonderful job on the challenge! and the flavors combination sounds amazing! I love your different versions! I've never use Amaretto in Tiramisu but I really must give it a try, I can imagine how well it goes with the other flavours. Great food, clunky writing and amateur photography!